It is no secret that Texas weather can sometimes become a bit chaotic. From rain storms to unexpected hail showers, Texas weather can be damaging to boats and RVs that aren’t properly stored. In fact, storing a boat or RV in Aubrey, Texas can be a challenging task if you don’t have ample driveway space or a large enough garage to accommodate the size of your vehicle. Fortunately for boat and RV owners, Universal Storage proudly offers boat and RV storage solutions. For over a decade, the Universal Storage team has helped countless RV and boat owners to more easily store their transportation vehicles throughout all of the seasons. Universal Storage solutions provides both covered and uncovered boat and RV parking. The covered parking options will help to protect either vehicle from inclement weather, such as rain, thunderstorms, hail, and sleet. Covered parking can also help to protect a boat or RV from sun damage, which can cause the vehicle’s paint to chip or fade. Uncovered boat or RV parking is the optimal solution for vehicles that require a short term storage solution. Boats or RVS that have already been covered with a protective tarp or customer covering can easily be stored at Universal Storage’s uncovered parking spaces. 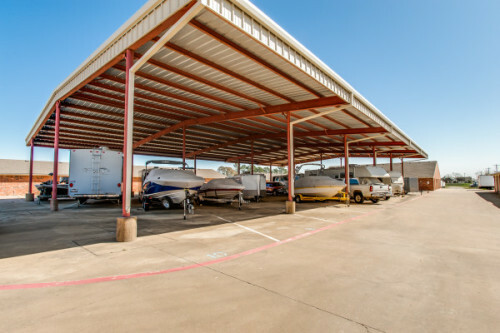 To learn more about uncovered or covered RV and boat storage, contact a member of the Universal Storage family today at 940-365-0551 or 214-794-9117. With the help of a trusted and knowledgeable member of the Universal Storage family, you can easily discover the ideal storage and parking solution for your RV or boat.